How far would you go for food? MUSEO is a restaurant and barroom located at Quayside Isle, a new hip hang out place among Singaporeans located at Sentosa Cove, which is a good getaway away from the bustling city. With a clear view of yachts and possibly a potential sunset with an unobstructed view, you can expect a comfy meal at MUSEO in an elegant and refined setting. And if you were wondering what is the meaning of "art on the isle", it means you can also art jam (paint) at MUSEO - perfect for parents who want to enjoy their meal while their kids have fun exploring their creative side. 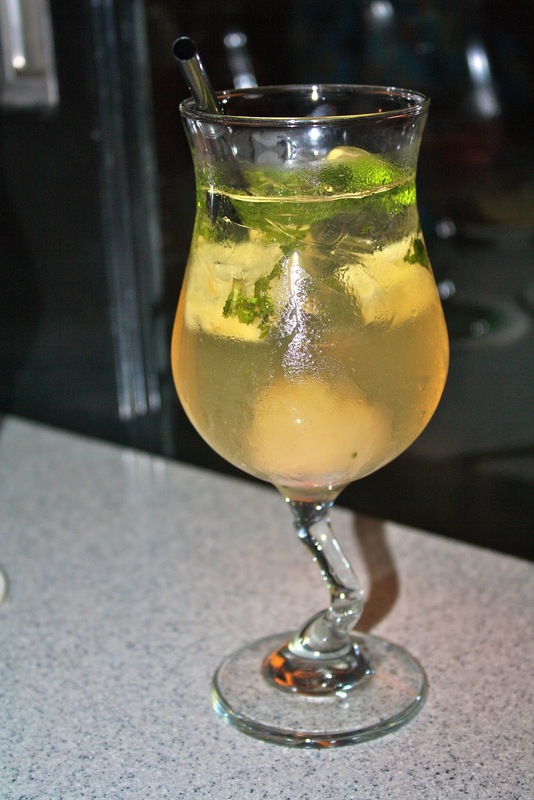 Their menu offers an extensive range of cocktails specially created for the restaurant. They also offer "dietary cocktails" if you happen to be watching the waistline and most of their cocktails contain fresh fruits in them. If you are a fan of Arteastiq at Mandarin Gallery, you'll be glad to know they serve the exact same teas at MUSEO as well. We skipped the dietary ones and went for the classics. I was recommended the Berries Galore which i found pretty mediocre while the partner went for the Earl Grey Chocolate Tini, which we both didn't really know how to appreciate. However, we were recommended the Thyme and Grapes from the dietary menu, which made up for the exquisite and awkward taste we couldn't quite understand from the Earl Grey Chocolate Tini. The Thyme and Grape has vodka, sake and fresh grape juice in it but there wasn't a hint of alcohol at all (or maybe because we are guys), it tasted just like refreshing fresh grape juice. 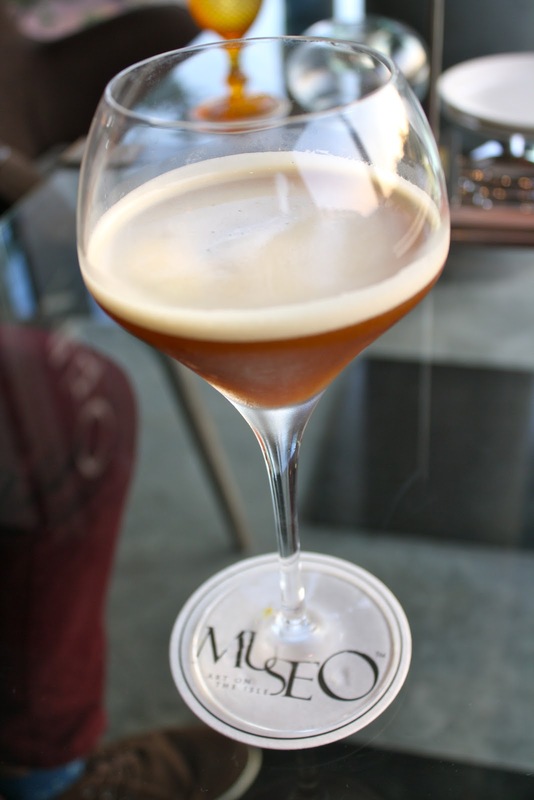 Another of my favorite that i will be back for is the Beer Slush at MUSEO. 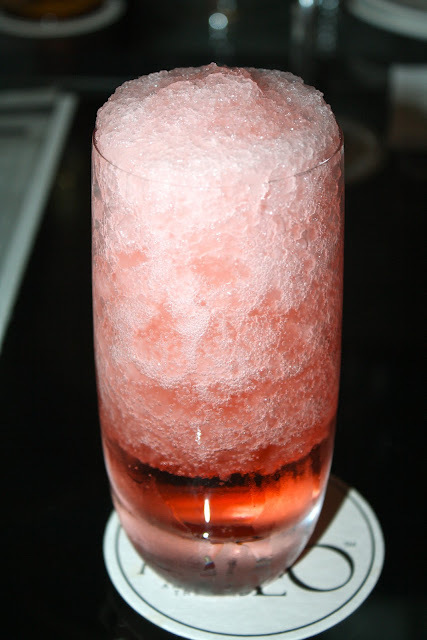 We had the Strawberry Cider which they made into slush. It uses a machine to create beer into beer slush without over-freezing it. And yes they can do this for any beer you order at MUSEO, just that you will probably have to be patient and wait awhile. I recommend the fruit flavors, and promise you that you will look at beer in a different way after your first sip. The Mezzanine is something you will see on almost every table at MUSEO. The concept of having four different side dishes on a tray is pretty innovative. There's a list of items you can choose from (named after famous paintings), or if you are the indecisive sort, there's also a pre-set one with their popular items for your convenience. 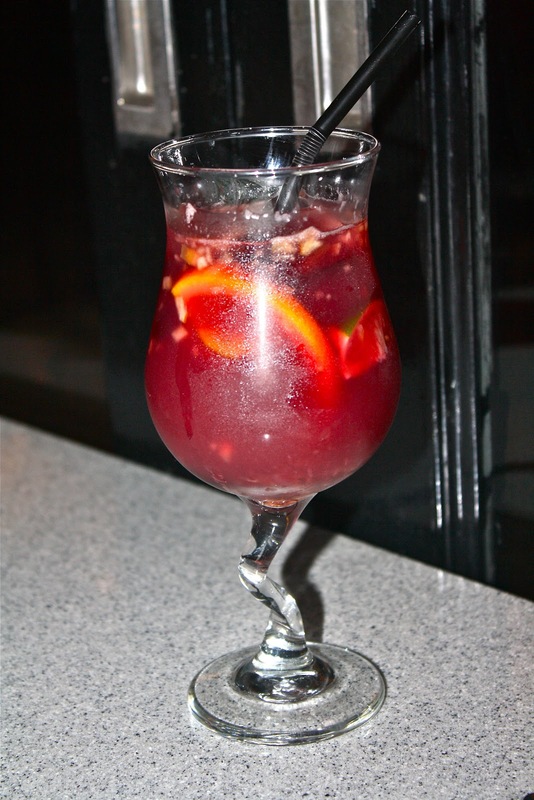 The set is good for two to share, or more if you are just hanging out over drinks with a few friends. We had the Smile of Mona Lisa (Deep Fried Camembert Cheese) which was served with cranberry sauce. It was very rich in flavor and had a very crispy exterior and although i didn't like it better with cranberry sauce, adventurous people who like to mix flavors around might like it. The Monet's Garden of Lilies (Mango Prawns) however, did not really impress. The dressing was tasty but the chunks of prawns were slightly too small to savor the entire dish properly. One of the recommended items is the Joys of Life (Roast Pork Belly) that came with hot sauce. The roasted pork belly tasted more like pork knuckle instead of belly and the meat, although moist, came off a tad too tough. The skin of the pork was crispy and it went well with the hot sauce, which tasted and looked like sweet chili. My favorite of the lot was the Three Musicians (Soft Shell Crab). The crispy and evenly battered soft shell crab was served with a tangy chili tomato sauce which resembled the taste of Singapore's signature chili crab. I had the Two Way Lamb which left me with mixed feelings. The shepard pie had a layer of cheese on smooth and creamy potato mash and there was a decent amount of lamb chunks in tomato base beneath. However, the lamb rack, although nicely seasoned was overcooked to the extent i had problems cutting through the meat without worrying about whether it would fall off the plate. A better choice of entree would be the Pan Roasted Cod Fillet. The delicate cod fillet had a generous amount of onion relish on top of it which added a lot of flavors and the fish was tender and fresh with minimal seasoning. The baked scallops were also fresh and not overcooked. Of course, the light risotto with shaved parmesan was also given the thumbs up by the partner. For dessert, we had the Strawberry Crumble, which i am very certain i would come back for. The red wine stewed strawberries with crumble was served hot (not warm) and paired extremely well with the champagne vanilla gelato. There was a generous amount of strawberries underneath the crumble and i recommend this to share, especially after a heavy meal. While MUSEO definitely isn't a place that will be "on the way", it is definitely a place one could use to unwind away from the city crowd. And while you won't exactly find the cheapest prices on their menu, the view from the restaurant is already pretty priceless, unless you own a lavish apartment at Sentosa Cove, which will set you back by a few millions. The question is - how far would one travel just for food? This post isn't going to get any classier than the title above. Define "Singapore Class" for me, if there is even such a terminology to begin with at all. It all begins one day when a few of my friends were discussing about my blog and about the food i review. DC* : "Eh Nicholas, why don't you write about hawker food?" In a joking manner, i replied : "I think it is more classy to write about restaurants." DC* : "Your class is Singapore Class." To make things clear, i don't think hawker food is not classy. I was merely passing it off as a remark. I love hawker food and i think they are exceptionally yummy, despite the fact that i have to sometimes queue at my favorite stalls just to satisfy my craving for a particular food. I don't write about hawker food because there is a limit to what i can expand - there isn't much to write about (unless it is a comparison of the same type of food from different stalls). As Singaporean as i actually am, i still love and do Instagram photos of hawker food every now and then. Then again, my point is that i was joking when i made that comment about being classy and only writing about restaurants. However, i don't think calling someone "Singapore Class" can be taken into context as a joke. After he made that comment, i asked him what he meant by "Singapore Class" and i remember him saying something along the lines that he didn't mean it that way. In short, he felt bad after making a rude snide remark at me saying i am "Singapore Class". Here's a little bit more about DC*, in case you want to know (to be honest, i am contemplating on revealing his real name at the end of this post). DC* went to the very prestigious Raffles Institution and went on to study at Yale University upon receiving the Singapore President's Scholarship in 2008. For your info, the President's Scholarship is the most prestigious scholarship in Singapore. In this case, i am very certain DC* isn't the more prestigious ones amongst the recipients. How can someone in the right mind who has taken a scholarship from Singapore (yes, his own country) call me "Singapore Class"? While many people who had taken such a prestigious scholarship from a meritocratic state ended up in high-rank, governmental positions, i am skeptical and at the same time worried for the future of our home country if he were to take charge of our national affairs - with his poor character and moral ethics. I wonder if it is because he graduated from Yale University and thinks that he no longer labelled as "Singapore Class" but instead "American Class" or even "Elite Class". Why would someone so smart possess such degrading and arrogant behavior? And who is he to say i am "Singapore Class" when Singapore has funded for his education that his parents could probably never have been able to afford and put him through? There is only one word to describe him - ungrateful. Going to an Ivy League university does not make him an elitist, neither does it make him more superior than others in terms of character. Yes, he may be smarter, but a complete turn off when he makes self-righteousness remarks labeling "Singapore Class". What right does he have to call me "Singapore Class" when he has no class of his own, except maybe a "class" from Yale. Yes, i meant a class(room). The point i am putting through is that DC* obviously wants to be the minority and have exclusivity. I however find it bewildering that he does not understand the nature behind me making that statement that i do not write about hawker food and decided to say i am "Singapore Class". Not withstanding that the aftermath conversation happened to evolve to imply that i am just like the masses amongst Singapore. Thus a scholar finds that the masses are shallow; he deemed to be or so his Yale education thinks we are. DC* is someone i have worked with before and he comes of as someone who is self-righteous and will make sure things go his way. Of course, like in most government sectors, being a scholar gives him an advantage - being more likable and "sought after". 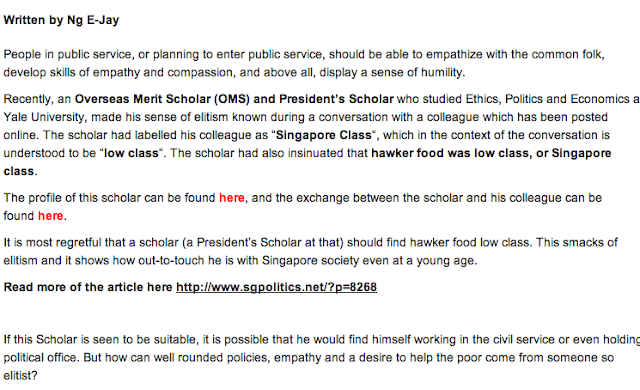 If a scholar can call a common man "Singapore Class", then what is he? Higher class? If so, is he sowing differentiation which the government is opposing? The reason I'm dedicating this post regarding this issue is primarily to question the suitability of candidates hand-picked for the President Scholarships and at the same time, to give a thought about our nation's future. With many older generations flaming comments about the neo-generation and their attitudes amidst the changing times, I'd like to stress that humility is the way to go. Hubris will only erode one's character and one will not go far in life. Speaking of classiness, a colleague once gave him a ride back and he offered to pay my colleague 50 cents for a 30km car ride. Indeed, you can pay for school but you can never buy class. And if you are itching to find out just who DC* really is - Google is your best friend. Update : Read about "Singapore Class - So What Exactly Is It". You may have noticed my recent Instagram pictures of tattoos and may be wondering why have i recently gotten so many tattoos. Firstly to clarify, i am not psycho. Tattoos are super "in" these days among youngsters but statistics has shown that 6 out of 10 people who get inked regret doing it. And before you start pointing fingers at me saying i am trying to be "cool" with so many temporary tattoos on me, i also want to clarify (again) that i have them on for fun and not because i want people to think i have real tattoos. Enough of clarifications (i believe you got my point), Gumtoo is a designer tattoo company based in Singapore with designers from around the world. They have a huge range of designs you can choose from on their site - some fun, some quirky, and a few kiddish ones for the kids to have fun with. Best of all, they don't look like temporary tattoos. You know how some temporary tattoos come out shiny and next thing you know you get people mocking you for putting one on? I tried Gumtoo temporary tattoos on and some of my friends got fooled into thinking i got inked. Of course, the ones that didn't get fooled were the ones that know me best - that is, i am scared of blood, so doing the real thing is going to take me more than just courage. Also, i had a Gumtoo temporary tattoo on for two weeks and the tattoo has not faded since then. It is that lasting as compared to other temporary tattoos which will probably last you a couple of days. If i had my pick, i would go for the Typography Collection which has wordings such as "Fly" and "Refused", which i think make pretty cool "party accessories". Another one which i liked was the "On Off" buttons from the Quirky Collection, as well as the "Zippy" from the Accessories Collection which is one of my favorites among all the tattoos at Gumtoo. Each temporary tattoo is made in USA (yes, not China so rest assured about the quality) and comes with instructions at the back of each temporary tattoo. Give it to a 7 year old kid and he/she will probably know how to work it by themselves - it is that easy and simple. They are also tested safe for the skin and does not cause skin irritation or allergy. The best part about these temporary tattoos is that they are not going to cost you an arm or a leg, since that is where you will probably be placing them on. They comes in sets of two, which also means you can give one to your friend, or keep it for another occasion. Each set of two is approximately SGD 5, which works out to about SGD 2.50 per temporary tattoo - pretty reasonable in my opinion. They offer free shipping within Singapore and SGD 2 for international shipping. I also really like their packaging which comes in a customized brown envelope. If your items do not reach you, drop them a mail, no questions asked and they will send you another. And yes, if you don't like the design, take it off and stick a new one on - painless and fun. Really, unless you are certainly sure you want a specific tattoo looking back at you when you stare into the mirror for your whole life, i think you could use one from Gumtoo for now. If you don't find one you like for now, fret not because they update their site regularly with new designs and like i mentioned earlier, they have designers from all over the world. They are also available at Actually Singapore, located at 29A Seah Street and 118A Arab Street, in case you are the impatient sort that cannot wait. But of course, given the pretty funky designs they have, it's perfectly understandable if you are getting a little impatient - www.gumtoo.com. This post was brought to you by Gumtoo.